The annual Teen Trialogue series is an effort to encourage interaction and dialogue among Christians, Jews, Muslims, and often persons of other faith traditions as well. The three-session series has been enormously popular and successful since its inception in 1983 and provides an opportunity for high school students from the Jewish, Christian, and Muslim faith traditions (and sometimes others) to discuss and learn about their own faith traditions while simultaneously exploring others. It fosters a strengthening of each participant’s chosen faith, a better understanding of other faiths, and cross-cultural and inter-religious friendships. 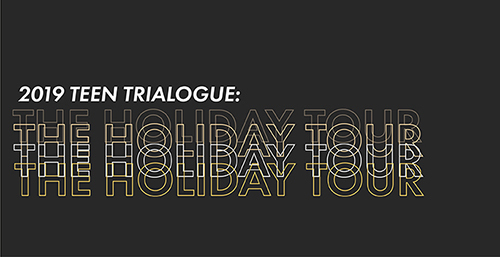 Over a series of three Wednesdays in February, the 2019 Teen Trialogue series focused on holidays in various faith traditions. Each session was guided by youth leaders from the host congregation, and students discussed holidays central to their faith traditions and answered questions relating to their celebrations and significance. 2019 hosts were Peace Academy, Temple Israel and All Souls Unitarian Church.